Leaving the Castle and proceeding up Standard Hill (so called from the fact that Charles I. planted his standard there in 1642), St. James’ Church is reached. This is a neat stone-cased edifice, with Gothic windows, and was erected by subscription in 1808. On the left the General Hospital is seen, situated on the top of the hill. This building was opened September 19, 1782, since which time (in 1829, 1854, and 1878) it has been frequently altered and enlarged. It is open for the reception, maintenance, and treatment, of such sick persons as are deemed eligible, and ranks as one of the largest and most useful institutions in the country. There is accommodation for a hundred and fifty in-patients. The illustration is a view of the front of the Hospital, which stands at right angles to the road. Opposite the entrance gates, and as if nestling under its wing, is the Children’s Hospital—founded in 1869—the very name of which implies the object for which it was founded. It is supported by voluntary subscription, and is open for inspection by visitors daily. Proceeding up the street—Postern-street—visitors will find themselves at the top of Park-row, opposite one of the covered reservoirs which supply the town with water. [Visitors who do not desire to see the Catholic Cathedral and the General Cemetery should pass down Park-row, cross the street at the bottom (Chapel-bar and Derby-road), enter the narrow thoroughfare opposite (Parliament-street), and proceed to the left past the Clarendon Hotel and the Masonic Hall (page 38), and visit the Free Public Natural History Museum (page 36), the University College (page 34), Free Library (page 36), the new Guild Hall (page 38), retrace their steps, pass the School of Art, and follow the Guide, beginning page 27.] Thence the route is east. 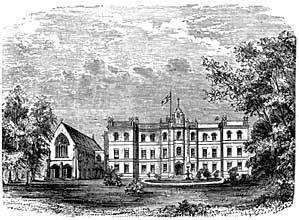 Arriving at what is commonly known as "The Bay of Biscay," visitors will see on the right, in "the Ropewalk" and College-street a superior Board School, erected by subscription in 1846, and since considerably enlarged. This is "The People's College." Visitors should now proceed to Derby-road, where is St. Barnabas' Roman Catholic Cathedral, which was completed in 1844, from the designs of the celebrated Pugin. The church is so rich in architectual beauty, at the same time so simple and unobtrusive in its general appearance; that it may be said to rank amongst the most attractive objects in Nottingham. The plan of the church is cruciform, and is one hundred and ninety feet long from east to west. The interior is solemn and effective. The decorations throughout are very good. It is one of Pugin's best productions. The tower is surmounted by a spire of early type, the whole being about one hundred and fifty feet in height. At the base of the spire are images of SS. Peter, Paul, John the Evangelist, and Barnabas. A former Earl of Shrewsbury was the principal benefactor to the find raised for its completion. The Convent and Schools adjoining are dedicated to "our Lady of Mercy," and are located in the by-street, facing the facade of the Albert Hall. Opposite the Church is Labray's Hospital, for six old married men and their wives, and near to, as already suggested is the Albert Hall, the finest public hall in the town, and surpassed by few in the provinces for appearance and acoustic properties. There is a Lecture Hall in the same building. 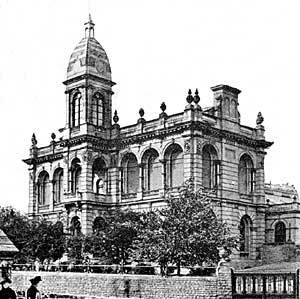 The Albert Hall cost about £15,000, and was opened 26th September, 1876. It was designed by Mr. Fothergill Watson, of this town. Ascending the hill, on the left is Derby Road Chapel, erected in the Early Decorated style of art, as a place of worship for the Particular Baptists. Nearer the summit of the hill, is Lambley's Hospital, where twenty-two almsmen and women, burgesses or widows of burgesses, are lodged. An inscription over the entrance records the names of its Founders, and the date of its foundation. A large open space now presents itself, in the centre of which is a Weighing Machine House of novel design. This space formerly divided the town from the county. On the right is a massive-looking carriage entrance, with weather vane and dial (flanked by more Alms-houses), built in the Grecian style, and leading to the General Cemetery. Immediately on entering the grounds (formerly known as the Larkdales), which are tastefully laid out, profusely planted with shrubs, and well kept, visitors are struck with the beautiful views which are presented, on all sides, of the surrounding neighbourhood. The foreground is filled in by the Arboretum, of which we shall hereafter have something to say. 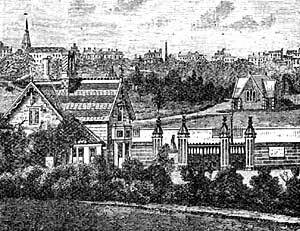 On the right is St Matthew's Church, situated in Upper Talbot-street, a neat substantial structure in the Early English style, from designs by Mr. Roberts, F.S.A., of London; and on the left, in the distance, may be seen All Saints' Church, erected entirely by the munificence of the late Mr. Windley, an eminent silk manufacturer and magistrate of the town. It is built in the Early Decorated style, from designs by Messrs. Hine and Evans, also of Nottingham. Other objects of interest present themselves, but which will be noticed as the visitors-proceed; for some time at least, they will have sufficient occupation in observing the numerous memorials which surround them, and which mark the last resting places of the peaceful dead. Where everything betokens affection it is almost invidious to call attention to any particular object. We may, however, point to the names upon the tombs of Dr. Marshall Hall, the Rev. Joseph Gilbert, and Mr. George Gill, as some of those who rank amongst "Nottingham worthies." The Cemetery comprises about twenty acres, and was incorporated by Act of Parliament in 1836. This Cemetery, which is nearly full, is devoted to the interment of Roman Catholics and Nonconformists. The Corporation have appropriated part of Bulwell Forest for the purposes of a Cemetery (see page 29). MIDLAND INSTITUTE FOR THE BLIND. Leaving the Cemetery, by the upper walk, on the right, visitors will pass through a somewhat narrow outlet, bounded on the left by the simple and unostentatious Burial Ground of the Quakers, to Clarendon-street, opposite the Midland Institution for the Blind. 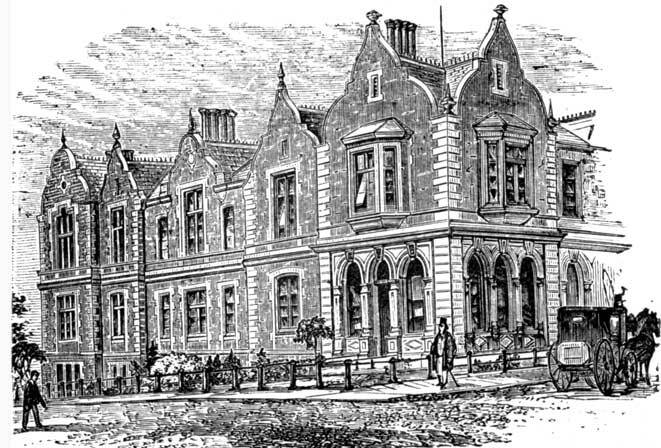 This handsome and commodious building was opened in 1853, "for the instruction and employment of the blind of both sexes, from the counties of Nottingham, Derby, Leicester, Lincoln, and Rutland." This institution is accessible on weekdays from ten to twelve, and from three to five o’clock. The sale-room is in Chapel-bar. Adjoining the Asylum, in Chaucer-street, is the Female House of Refuge, an establishment especially provided for the shelter, protection, and reformation of females, who had previously been leading a life of sin and wickedness. Descending Clarendon-street, and entering Waverley-street, the School of Art claims attention. It is opposite the "bottom" gate of the Cemetery. This School was originally established in 1843, "for the purpose of affording instruction in designs for manufactures, and in the history, principles, and practice of the ornamental art," and is one of the most successful Art Schools in the country. It is open to the Public every Saturday afternoon. The building is a specimen of the Venetian School of Italian architecture. The corner stone was laid Oct. 22nd, 1864, by the late Duke of Newcastle, KG., Provincial Grand Master, and the Freemasons of Nottinghamshire. A few steps further and the gates of the Arboretum - invite visitors to enter. Of this Lodge we give an engraving from a drawing taken inside the Arboretum, and looking on to the General Cemetery, to which reference has been made. From the tablet, on the Lodge visitors will learn that it was opened to the public May 11, 1852. It comprises seventeen acres, and presents within itself a beautiful landscape, a People's Park, and an ornamental Garden. It is laid out with exquisite taste and skill, is planted with innumerable and choice shrubs, and in the autumn presents such a floral picture, as to become a "thing of beauty," and the heart sighs that it might also be a "joy for ever." ARBORETUM GATES AND GENERAL CEMETERY. The large building on the north-west side of the grounds, in the Tudor style of architecture, comprises spacious Refreshment Rooms (where the "cups that cheer" and other of nature's requirements are provided). On the south-east walk is a statue to Feargus O'Connor, formerly an M.P. for the borough. The most conspicuous object, however, in the grounds, is the War Trophy, which consists, in part, of cannon taken at the siege of Sebastopol, and a Chinese bell, taken in a recent war with the Celestials. The edifice, under which the bell is hung, and which is unique of its kind, was designed by the late Mr. Tarbotton, borough engineer. It is about forty-five feet in height. The cannon, taken in the Crimea, occupy the angles of a stone platform. Every particular respecting it is inscribed upon the four sides of the platform which supports the trophy. The views from the grounds are most extensive, and give a correct idea of the rapid manner in which the town has extended itself. Conspicuous amongst the many objects brought under notice, is All Saints' Church and the High School, a stately edifice of stone, opened in 1868, and well adapted for the important objects for which it is intended. The "High School" (or, as it was formerly called, the "Free Grammar School ") was founded in 1513 by Dame Agnes Mellors, who partly endowed it. The Girls' High School, a building of far different design, is a little beyond this, and is residential in appearance. The Arboretum should be left by the eastern Lodge, by a road under a bridge, and along an avenue— immediately opposite the central walk.